“When the country was shut down last month, some oil companies who obtain fuel from Mabvuku and Masasa were not collecting fuel because they feared for the safety of their trucks, as a result there were no deliveries,” the minister said. “So when they started deliveries they concentrated on towns, hence the situation had improved in the cities. “I have been receiving messages that the fuel price is going up to $5 and the motoring public is again in panic mode,” Gumbo said. “I do not know why some sections of the media are doing that. “This is why at one point the internet was shut down, but let me beg the authorities not to shut it down because it disturbs me a lot in my operations. 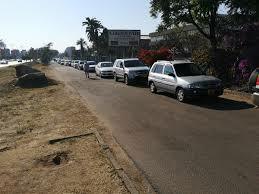 Gumbo claimed the country had enough fuel reserves at depots in Harare’s Mabvuku and Masasa depots. “There is no need to panic at all, it’s all up to the Reserve Bank of Zimbabwe and other companies to source their cash and buy the fuel, and it’s plenty,” he said.